We already knew about one major character that would not be back next season on The Good Wife. Now, it turns out another series regular is heading for the door. It appears that Matthew Goode will also be missing from the halls of justice this fall. According to TV Line, they have learned that after only one season as a regular cast member, Matthew Goode, who portrayed attorney Finn Polmer, is leaving the show. This on the heels of Archie Panjabi’s departure in the season 6 finale earlier this month. While Panjabi’s exit was potentially acrimonious, it does not appear that there is any such bad blood regarding Goode, as he may return for guest spots in the future. Fans of The Good Wife were both thrilled and horrified when Panjabi filmed her last scene with star Julianna Margulies. The two actresses hadn’t been in the same scene together in over two years, allegedly due to bad blood between the two. Then it turns out they may not have been in the same room to film their last scene together sitting at a bar, as it's been reported there were body doubles and split screens involved. What do you think? Awkward much? 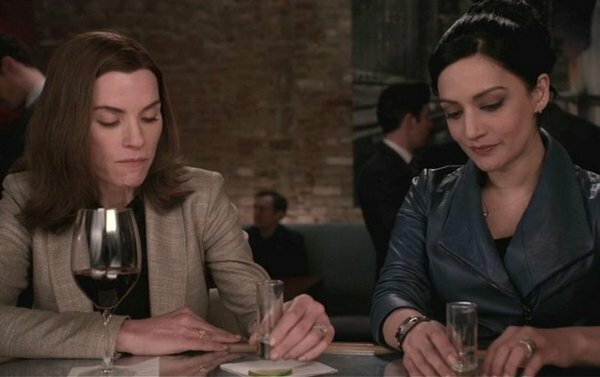 While The Good Wife is no stranger to shocking ends to characters, Goode’s exit from the show was significantly anti-climactic. (Can something be signifcant and anti-climactic at the same time? Nevermind) While his character Finn did decline a job at the law firm of Margulies’s character Alicia, it was not obvious that this would mean he would be exiting the series. Rather, the fact that this news is coming out now implies it may not have been part of the plan. Matthew Goode has plenty of work ahead of him though. Word is Goode will be reprising his role from the Downton Abby Christmas episode, Henry Talbot, during the show’s upcoming final season. These two major departures leave some interesting opportunities for The Good Wife’s upcoming Season 7. Are we getting ready for some all new characters to arrive, or will existing characters be taking on more important roles? Will Matthew Goode be missed, or was he doomed from the start for simply not being Josh Charles? Where do you see the show heading this fall?